For a long time now, I've been thinking about buying a treeless saddle. But either they were too expensive, discontinued, or it just wasn't the right time to buy a saddle. However, I think I might just have to save up for this one. It's a Shasta Echo and 1) it looks SO comfortable. 2) it looks sharp. 3) it would fit Eddie really nicely and 4) it would allow us to ride for longer periods of time with more comfort and more security. I know, I know... Some people don't like treeless saddles, but I gotta believe that this is more comfortable for horses because it doesn't have a tree. But it's a little out of my price range. And plus it weighs a lot more than the treeless ones. 10 pounds versus 30? That's quite a bit when you take into consideration that Force = Mass X Acceleration. That's a lot of mass! Plus, I can also leave the stirrups off of the Shasta Echo. I have always had treeless and love them. I have a barefoot, and a sensation. 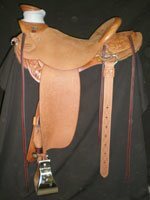 I used to also own a Ansur, but sold it because I didn't show anymore and it was a fancy saddle. But the ansur was just as nice. Have fun looking! Too cool! How do you like the Barefoot saddle? I was looking at those too and was pretty interested in them. I love the idea and think it's a great alternative to regular saddles!